Eurofurence (commonly abbreviated EF) is a furry convention held in changing places in Europe every year (in Berlin, Germany since 2014 and will remain there for the time being). It was originally started in 1995 as a private gathering by nineteen European furry fans who met on the Internet. Attendance has been steadily rising since then, to 2804 at Eurofurence 23 (held in 2017), making it the largest furry convention outside the United States. The name of the convention derives from its American back-then-counterpart ConFurence, emphasising the European nature of the gathering. Since the year 2000, Eurofurence is no longer organized by individual persons but rather by the German Verein Eurofurence e.V., which serves as an administrative body for the convention. Contrary to most American furry conventions, Eurofurence traditionally took place at youth hostels. In 2007, Eurofurence was first held at a hotel (the Hotel Ringberg in Suhl). Below is a table of statistics regarding each year Eurofurence has been held. Since 1999 (possibly except for 6 and 9), the convention has had at least one guest of honour yearly. Since 2002, the convention has had a "theme" every year, with T-shirt designs and venue "dressing" to reflect the theme. 5–9 September 2007 Suhl, Thuringia, Germany The Unlucky Thirteen Lance Ikegawa, costume designer and Steve Gallacci, Creator of Albedo. [b] Alexander James Adams appeared as musical guest. 27–31 August 2008 From Dusk till Dawn Watts Martin, writer and fanzine editor/publisher, and Steve Gallacci. 21–25 August 2013 Aloha Hawaii! Warrick Brownlow-Pike, Andy Heath and Iestyn Evans from the BBC comedy "Mongrels"
^ Steve Gallacci was unable to attend the convention due to family matters. ^ Staff writer (23 August 1997). "Internet-Fans treffen sich in Bodstedt". Ostsee-Zeitung (in German). ^ Frank Hommel (8 September 2007). "Mit 'nem Tiger im Fahrstuhl". Freies Wort (in German). p. 2. Archived from the original on 28 February 2009. ^ Heike Hüchtemann (8 September 2007). "Rollenspiele abseits des wirklichen Lebens". Freies Wort (in German). p. 13. Archived from the original on 7 July 2009. ^ Staff writer (8 September 2007). "Eine Welt für sich". Thüringer Allgemeine (in German). ^ Conference Guests page (2007). ^ Conference Guests page (2008). ^ Guest of Honor (2012). ^ web@eurofurence.org. "Eurofurence 20 - Crime Scene Berlin - Aug. 20. - 24., 2014". www.eurofurence.org. Retrieved 5 September 2018. ^ web@eurofurence.org. "Guests of Honor". www.eurofurence.org. Retrieved 5 September 2018. ^ web@eurofurence.org. "Eurofurence 21 - Greenhouse World (Aug. 19 - 23, 2015)". www.eurofurence.org. Retrieved 5 September 2018. ^ web@eurofurence.org. "Our Guests of Honor - Eurofurence 21". www.eurofurence.org. Retrieved 5 September 2018. ^ web@eurofurence.org. "Eurofurence 22 - Back to the 80s". www.eurofurence.org. Retrieved 5 September 2018. ^ web@eurofurence.org. "Guests of Honor - Eurofurence 22". www.eurofurence.org. Retrieved 5 September 2018. ^ web@eurofurence.org. "Eurofurence 23 - Ancient Egypt". www.eurofurence.org. Retrieved 5 September 2018. ^ web@eurofurence.org. "Guests of Honor - Eurofurence 23". www.eurofurence.org. Retrieved 5 September 2018. ^ web@eurofurence.org. "Eurofurence 24 »Aviators - Conquer the Sky!«". Eurofurence 24 - Aviators - Conquer the Sky!. Retrieved 5 September 2018. ^ web@eurofurence.org. "Guest of Honor: Joaquin Baldwin". Eurofurence 24 - Aviators - Conquer the Sky!. Retrieved 5 September 2018. ^ web@eurofurence.org. "Welcome". Eurofurence 25 - Fractures In Time. Retrieved 5 September 2018. 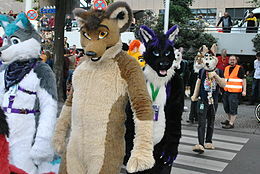 Wikimedia Commons has media related to Eurofurence. This page was last edited on 22 January 2019, at 23:07 (UTC).